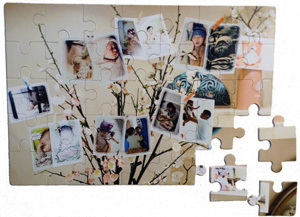 A 15-piece personalised jigsaw puzzle for invitations, reunions, or social events. Our 15-piece personalised jigsaw puzzles are a fun way to send invitations to weddings, parties, reunions, or social events. Ideal for save-the-date, birth announcements or change of address. Made from top-quality Daler Rowney artboard, these puzzles measure 148 x 105mm and are supplied made up in cellophane envelopes. A range of coloured envelopes, including gold or silver, is available to order.